We are conveniently located between Tunbridge Wells and Tonbridge. Just off the A21 we are close to Sevenoaks and convenient for Maidstone. Around 45 mins from Medway, Gillingham, Ashford and Rye. Driving ? Using Sat Nav ? Your Sat Nav may try to take you to Hildenborough when you input our Postcode, or the street name of Halfmoon Lane. If this is the case you must enter the road name as Dislingbury Road ! Don't blame us...Blame the Council ! From the M25 Jcn5 turn south on the A21following the signs for Sevenoaks and Hastings. Stay on the A21 until it ceases to be dual carriageway. One mile further on turn left immediately before the Shell petrol station down the wooded lane signposted to Capel. We are ¾ mile down this lane, the first buildings on the right. Heading North on the A21 you will join a section of dual carriageway just past the Blueboys Pub on the right. Go to the end of the dual carriageway and straight over the roundabout heading for London. ½ mile on the right turn right immediately after the Shell petrol station down the wooded lane signposted to Capel. We are ¾ mile down this lane, the first buildings on the right. Follow signs for Pembury. Near to Pembury you will see signs for London an A21. Filter left at the roundabout and join the A21 heading for London. Go to the end of the dual carriageway and straight over the roundabout. ½ mile on the right turn right immediately after the Shell petrol station down the wooded lane signposted to Capel. We are ¾ mile down this lane, the first buildings on the right. 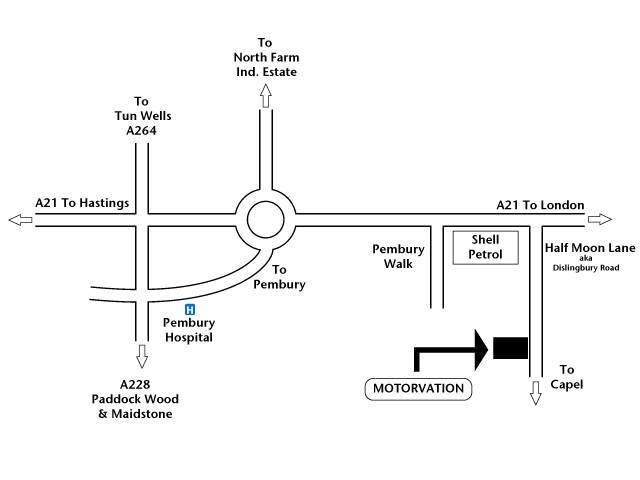 Leave Tonbridge on the Pembury Road, at the roundabout at the Vauxhall Inn, follow signs for A21 Pembury and Hastings. On joining the A21,one mile further on turn left immediately before the Shell petrol station down the wooded lane signposted to Capel. We are ¾ mile down this lane, the first buildings on the right. Head for Tonbridge/Tunbridge Wells. At Wateringbury turn left at traffic lights towards East Peckham. Through East Peckham, past the Whitbread Hop farm pass straight over the next two roundabouts and keep on until the traffic lights at Pembury ( Edenbridge Honda on Left ) Turn right at lights past the Hospital, join the A21 at the roundabout and turn right onto the A21 towards London. ½ mile on the right turn right immediately after the Shell petrol station down the wooded lane signposted to Capel. We are ¾ mile down this lane, the first buildings on the right.